← Shedding the Light on Night Lights! Having developed toys for little ones since 1930, Fisher-Price definitely understands how babies’ brains work. They understand that babies grow and change at a super-fast rate, often leaving parents bewildered as to what toys are best for their little one at that particular stage in their development. There are so many toys out there, all with different benefits, so it’s easy for parents to get confused. To solve this problem, Fisher-Price have created a range of innovative toys that change alongside baby, featuring three unique stages that help baby learn and grow. The Smart Stages technology allows you to change the learning content of the toy, meaning that the toy is always suitable for the stage your little one is at. Just a flick of a switch and the toy has immediately levelled up (or down)! Smart, right? Level 1 is designed for when little ones are to learning to explore! At this level, the toys inspire curiosity and encourage babies to get to know their surroundings. This level features early learning concepts, such as the concept of cause and effect. It also features fun phrases and playful songs, as well as a range of activities appropriate for the age group. Level 2 is perfect for encouraging babies to develop their talking, thinking and listening skills. The toy at this stage asks basic questions and offers simple directions to engage the little one and encourages them with verbal rewards, such as ‘well done’ and ‘good job’. Level 3 is perfect for creativity. This is the time when baby is developing their sense of imagination and engaging in pretend play. This level inspires imaginative fun with songs, sounds and phrases for creative, open-ended play! As well as being fun, bright and engaging, these toys offer you great value for money, as well as providing your little ones with a friend that develops at the same pace as them. 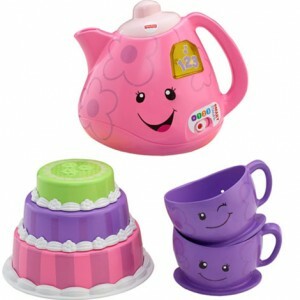 From the exhilarating ride on Smart Stages Scooter, to the sophisticated Smart Stages Tea Set, this brilliant range has something for every child! 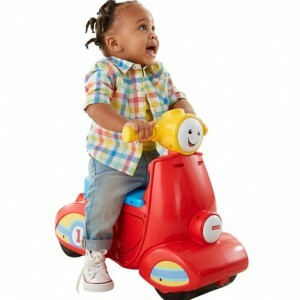 Check out our Fisher Price page for more great products!